bl.uk > Online Gallery Home	> Online exhibitions	> Asia, Pacific and Africa Collections	> Sanchi. Small miscellaneous drawings. 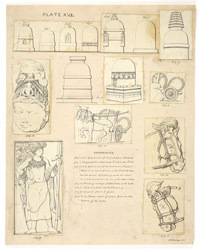 Small pen and ink drawings by Frederick Charles Maisey, dated 1847-1854, inscribed: 'plate XV' and 'References. fig 1-5. Specimens of miniature stupas. fig 6. Shape of the ordinary Linga and Yoni. figs 7, 8, 9. specimens of miniature sthupas. fig 10. Head of image of Buddha at N Gate. fig 11. Chariot from entablature of N Gate. fig 12. Chariot from S gate. fig 13. [Door-keeper from West gate]. figs 14, 15. Head Stalls of Horses from entablature of W. Gate'. Lieutenant Maisey spent the cold seasons of 1849-50 and 1850-51 at Sanchi to prepare an illustrated Government report of the antiquities of the site. He was joined by Major Alexander Cunningham in 1851. The result of his work was published in 'Sanchi and its remains' of 1892, illustrated by reproductions of his own drawings. The Buddhist site of Sanchi is of outstanding importance for the number and variety of its preserved monuments and sculptures, mostly stupas, built between the third century BC and the sixth to seventh century AD. Situated in a peaceful and meditative site crowning a hilltop, Sanchi was ideally located in proximity to the prosperous city of Vidisha. The foundations of this monastic centre were laid by the emperor Ashoka (reigned circa 269-232 BC) who built the original stupa (Stupa no.1) and erected a monolithic pillar in the third century BC. The stupa was later enlarged and encased in stone around the1st century BC under the Shungas and four magnificent gateways or toranas were added at the cardinal points. The drawings in this view depict details from the great stupa and various miniature stupas.